This is a good example of the “there’s a good story almost everywhere if you look for it” school. I found out about Bruiser by doing a Google search after finding his grave in a pet cemetery. I wrote the story for my wife’s real estate blog. Bruiser the German Shepherd did not have what you may think of as an auspicious beginning. His first owner got rid of him because he bit somebody. A dog who bites people would probably not be accepted today as a good police dog candidate. But back in the early 1970s, things may have been a bit looser. The St. Petersburg Police Department wanted to start a canine unit, and Bruiser was available. So that’s what happened – Bruiser became the city’s very first canine officer in the early 1970s. Officer Bill Trappman became Bruiser’s handler, partner and friend. Together, they rescued a little girl in what was one of the decade’s biggest local crime stories. In June of 1972, Trappman and Bruiser were called to a home near Booker Creek. An hysterical woman told Trappman that a man had broken into her home and kidnapped her two-year-old daughter. Bruiser immediately picked up the trail, even though a recent rain had made tracking very difficult. In just a few minutes, Bruiser led Trappman to nearby Booker Creek, and Trappman’s flashlight beam picked up the sight of a man who was slamming the little girl against a tree trunk. The man tossed the little girl in the creek and then jumped in himself. Trappman went after the girl, while Bruiser pursued the man. The girl survived the incident, and the man, a former convict who had recently been released from prison, went back to jail. Trappman gave all the credit to Bruiser. Bruiser was eight years old when all that happened. Four years later, when he was 12, the pain in his legs and hips got so bad that Trappman realized the time had come. He carried Bruiser to the vet’s, and he was put to sleep. According to Trappman, Bruiser sniffed out more than 14,000 pounds of narcotics during his career, and helped send 127 criminals to prison. 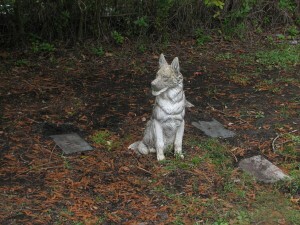 On the day after Christmas, we decided to tour Green Mounds Pet Cemetery, a nearly forgotten pet cemetery behind Fletcher’s Harley-Davidson on US19 in Clearwater. The Fletcher family now owns and cares for the cemetery, having taken title to it when they bought a large tract of land behind their motorcycle dealership. 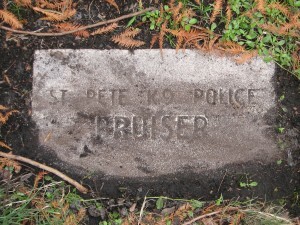 Bruiser’s grave is surrounded by a number of other St. Pete Police canines, perhaps 10 or so. They watch over a peaceful and well-cared-for tract that is the final resting place of several hundreds of pets, mostly dogs and cats but also a pony named Twinkles, who has her own fenced plot. I didn’t have much speechwriting experience when I went to work in the U.S. Senate, but I did have a leg up on most people because I had loads of experience at writing news for broadcasters. At UPI, I spent many work shifts on the broadcast desk, writing news for radio newscasters. “Writing for the ear,” we called it. As it turned out, “writing for the ear” applied perfectly to writing speeches – it even used the same punctuation – three dots instead of commas, for example, no abbreviations and no capitalization. Or, more accurately, ALL capitalization. The idea was to make the copy as easy to read as possible since the speaker would be reading the words out loud with little opportunity to try to figure out complicated syntax or sentence construction. Senator William Hathaway, my boss, delivered this speech to the Young Democrats State Convention in Augusta, Maine. The theme – the ability to accept divergent views – was no accident. He was getting hammered by young people, many of whom were staunch environmentalists. Why? Because he was a longtime advocate of the Dickey-Lincoln Hydroelectric project – a project favored by labor because of the jobs it would have created, but opposed by many environmentalists because of the thousands of acres of forest land that it would have destroyed. By the way, that project was ultimately abandoned. IT IS ALWAYS A PLEASURE FOR ME TO APPEAR BEFORE A GROUP OF YOUNG PEOPLE – ESPECIALLY YOUNG DEMOCRATS. I SINCERELY BELIEVE THAT YOU ARE THE LIFEBLOOD AND THE FUTURE OF THE DEMOCRATIC PARTY. I HOPE THAT THERE WILL BE AN HONEST AND FRANK EXCHANGE OF OPINIONS BETWEEN US TODAY. I ALSO HOPE THAT YOU WILL ASK QUESTIONS AND… ON MY PART… I PROMISE TO EXPRESS MY VIEWS AS CANDIDLY AS POSSIBLE. MOST IF NOT ALL OF YOU HERE TODAY CANNOT REMEMBER WHAT IT WAS LIKE TO BE A DEMOCRAT IN MAINE 25 YEARS AGO. THE DEMOCRATIC PARTY IN MAINE WAS PRACTICALLY NONEXISTENT. WE WERE FEW IN NUMBER AND OUR INFLUENCE WAS NEGLIGIBLE. THE ENSUING TWO DECADES WAS A CLEAR STORY OF SUCCESS. AFTER NEARLY A CENTURY AS A MINORITY THE DEMOCRATIC PARTY OF MAINE CAME TO DOMINATE THE POLITICAL STRUCTURE OF THIS STATE. WHILE CHANGING THE FACE OF POLITICS IN MAINE WE MANAGED TO IMPROVE THE LIVES OF MANY MAINE PEOPLE. I BELIEVE WE WERE SUCCESSFUL IN THAT EFFORT BECAUSE WE WERE WILLING TO WORK TOGETHER AND TO HELP EACH OTHER. WE WERE WILLING TO OVERLOOK THE ISSUES THAT DIVIDED US AND INSTEAD LOOKED TO THE ISSUES THAT UNITED US. WE LISTENED TO EACH OTHER, AND WE CARED ENOUGH ABOUT WHAT WE WERE DOING TO WORK TOGETHER AS A TEAM. IT WASN’T ALWAYS AN EASY TASK. BUT WE NEVER LOST SIGHT OF OUR PURPOSE – TO MAKE MAINE AND THIS NATION A BETTER PLACE FOR ALL CITIZENS TO LIVE AND WORK… AND NOT JUST FOR THE WEALTHY AND THE WELL-TO-DO. OVER THE YEARS, THE DEMOCRATIC PARTY OFFERED THE VOTERS GOOD CANDIDATES, GOOD PROGRAMS AND A GREAT DEAL OF IMAGINATION. WE DELIVERED ON OUR PROMISES, TO THE BENEFIT OF THE VAST MAJORITY OF MAINE PEOPLE. AS A DEMOCRAT, I AM PROUD OF OUR ACCOMPLISHMENTS AND YOU… AS THE SUCCESSORS TO THIS DEMOCRATIC TRADITION… CAN BE PROUD TOO. BUT WE MUST CAUTION OURSLEVES AGAINST COMPLACENCY. THE TRIUMPHS OF THE PAST CANNOT BE RELIED UPON ON TO GUARANTEE OUR VICTORIES IN THE FUTURE. TO YIELD TO THAT TEMPTATION IS TO INVITE DEFEAT. OUR PARTY WILL NOT BE JUDGED BY ITS PAST PERFORMANCE… BUT RATHER BY ITS PRESENT POLICIES AND BY ITS FUTURE PROPOSALS. BUT TODAY I WOULD LIKE TO SPEAK TO YOU OF A SECOND DANGER THAT THREATENS THE DEMOCRATIC PARTY.